Brent is what the Brits call a “Train Spotter”. He finds the best locations for taking pictures and has had many of them published. He has a B.S. degree in Anthropology. When you add his field research excavations into thousands of year old Indian sites plus his mechanical abilities to restore Mercedes Benz rare “Gullwing” autos, you have a fellow that fits right in with the other folks at the shop. Born in Heber, Utah and growing up playing with his dad’s Lionel railroad models, Brent remembers his first encounter with the 844 when, at the age of four, he got away from his parents and climbed on the 844 to spots where he should not have been. That was the beginning of a lifelong interest in real trains. He went on to be a part of the opening day celebrations of the Calif. R.R. museum in Sacramento and rode the last run of the California Zephyr in 1983. 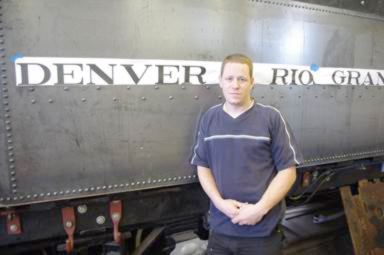 In 2012, Brent enjoyed visiting the 844 on its excursion to Ogden and wandered into the shop. When he saw what was happening with the 223, he was hooked. Brent now joins his dad in driving from Heber to Provo and then riding the Front Runner to the shop on Saturday mornings to join the restoration efforts. He and his dad purchased two RR passenger cars from the Henry Ford Museum in Dearborn Mich. and are looking for a steam engine to complete the picture. He sees the possibility of running the train to generate income to help children of need. Brent considers a steam engine a “work of art”. He says that if you listen, you can hear the engine talking to you. It will agree with you if you know what you are doing or tell you to change the way you are treating her. He looks forward to driving the 223 and seeing if the feeling is the same as driving the rare Mercedes Benz gullwing.